Build capacity within community organizations. Support community driven goals that have a public benefit. Increase the reach or effectiveness of successful projects. Grants: Non-profit and community-led organizations can apply for one-time funding of up to a maximum of $20,000.00. Applicants must provide a minimum of 10% matching cash funding and only one application per organization per year will be considered. Projects must be completed by March 31, 2019. Consultation Services: Recreation and Regional Services staff can assist community organizations with the application and the application process. 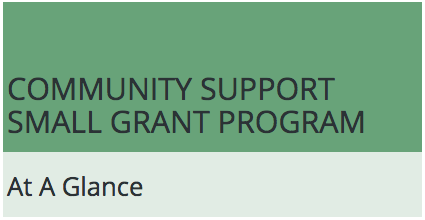 Eligibility Criteria: Non-profit and community-led organizations throughout Manitoba are eligible to apply for the Community Support Small Grant Program. Organizations must have been in existence for at least one year. Ineligible organizations include schools, hospitals, local governments and for profit organizations. Grant Payment Process: Grants to successful applicants will receive an initial payment of up to 60% of grant upon receipt of signed agreement. A final payment of 40% of the grant will be made on submission of a final report. Grants of under $3,000 will receive full payment upon approval. Application Process: Applications will be accepted on a continuous basis with notification made quarterly. If your community organization is planning a project, please contact your Recreation and Regional Services office to discuss how we can help.